When one of my best friends (also my cousin's wife) was diagnosed with breast cancer a few years ago, I was absolutely devastated. I would have given anything to take the cancer away, but I was helpless. So, when the chemo caused her to lose her hair, and she commented that all she wanted for Christmas was pretty earrings because people would only see her ears due to her keeping her head covered, I came up with a plan. I devised the Anonymous Earrings Saga. I started purchasing any earrings I could find which related to her or our friendship in any way. I would then package the earrings and give them to someone to ship... without a return address. She would receive these earrings in the mail and not know who the heck was sending them. It really gave her something to focus on other than the cancer, chemo, and sickness. In a six month period of time, she received over a dozen pair of earrings with postage marks from all over the country. In the end, I wrote a story about the whole saga and sent that to her with two final pair of earrings. She still wears the earrings, and she still reads the story every once in a while. At one point during this whole saga, my mother-in-law commented to me (as I was handing her a box of earrings to mail while she was on a trip), "I don't care who you are; it always makes you feel good to receive an unexpected surprise in the mail." That comment is SO true, and that was proven to me this weekend when I went to my mailbox and found a package. 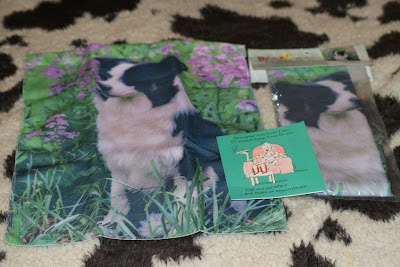 I looked at the return address and thought, "Hmmm, I haven't won any recent contests..."
Inside the package were two beautiful Border Collie flags and a very sweet card from my very dear friend Sandy, who hosts the blog I Beati. I was speechless! Sandy is one of the kindest souls I have ever had the pleasure of knowing. Not only does she know me well enough to know the perfect gift (not only Border Collies, but also flowers of my favorite color! ), but she got these gifts in celebration of Maggie's birthday and Camera-Critters' Anniversary. At a time when she can't really afford to be shipping me packages, she still wanted to do something special. I am deeply touched, and I am sincerely grateful to be able to call her my friend. I cannot express how touched I am by this gift. I will think of you every time I look at my beautiful flags! Your story brought tears to my eyes. It was so nice of you to send the earrings from different places. What a great idea. The flags are adorable! Just by reading her blog, I can tell that Sandy is a wonderful human being. I know she will be blessed for her amazing kindness to animals and people. Sure is great having friends who think of you. First of all, what a good soul you have. Anonymous Earring Saga is the sweetest thing. Your cousin-in-law was blessed to have you help her through that trial. That is so sweet! The both of you for doing what you did! I LOVE your story about the earrings. What a wonderful friend you are.